Ended Cold War and Communism, he was re-elected for a second term. He called the USSR the evil empire. Finding new weapons to talk first with, delivery missiles became an important factor. 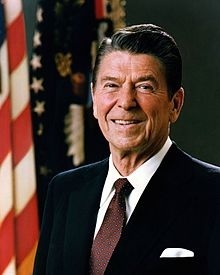 Ronald Reagan was the 40th US president, and a former Hollywood actor who was elected for a second term as President in 1984. He believed that the USSR was the evil empire and refused to negotiate with them for the first years of his presidency. 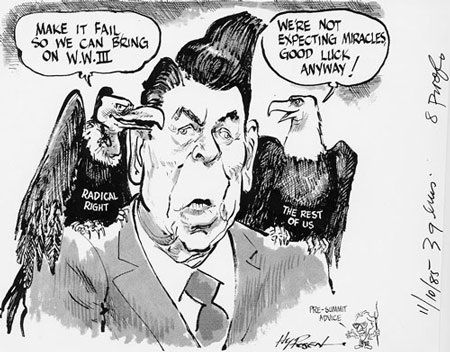 Reagan was much more hardline then other detente presidents. He increased military spending dramatically as part of the renewed arms race with the USSR. Castro couldn't even go to the bathroom unless the Soviet Union put the nickel in the toilet.